After updating to Fedora 20, locking the screen with the "CTRL+ALT+L" no longer works to lock the screen in the GNOME desktop. Previously the "CTRL+ALT+L" shortcut would bring down the screen shield and lock the screen. Now, when i press this key combo, nothing happens. I did some further tests: in gnome or gnome classic: doesn't work. In kde plasma and cinnamon, no problem: CTRL+ALT+L locks the screen. On Fedora 19 screen lock did not work without gnome-screensaver running , see https://ask.fedoraproject.org/en/question/35171/no-screen-lock/ . If Super+L (or CTRL+ALT+L in other window managers) does not work for you - verify if gnome-screensaver is running with ps aux | grep screensaver. The issue needs to be officially clarified in Fedora docs - does it work on Fedora 20 out-of-the-box? Does one still needs gnome-screensaver installed, and configured manually? 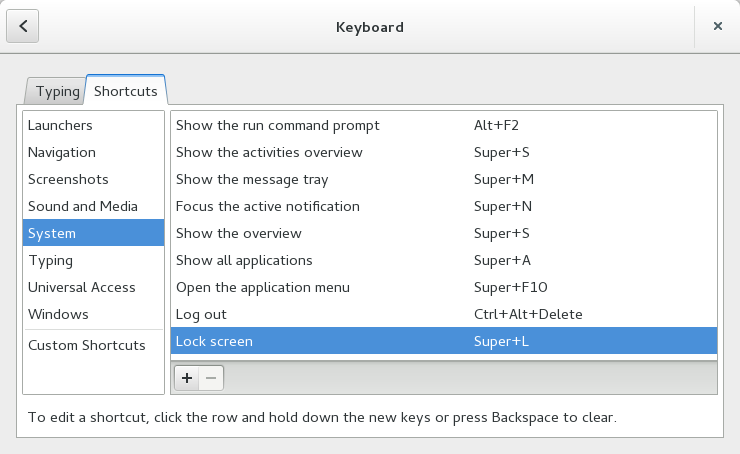 Fedora 20 includes GNOME 3.10, and in this newer version of GNOME, the default shortcut to lock the screen was changed to SUPER + L.
Make sure that in gnome3 you have set Super+L (or whatever you want) to lock screen. Just a quick note -- not every keyboard has a "super" key. My Model M does not. Hi I am also on Gnome 3, and super+L is configured on keyboad but still its not working. configure: error: *** XInput2 extension not found. Check 'config.log' for more details.